My oldest baby turns five today! I feel like she’s eighteen and getting ready to move out or something. And I’m pretty sure she feels like she’s sixteen and thinks she’s getting ready to drive. As a matter of fact she’s been asking me quite a bit lately when she’ll be old enough to drive a car…….. So, big day for us around here! We’re in the midst of a snow storm with an expected 6-7 inches of snow today and then get hit with an ice storm Sunday. Fun, fun. I had planned a little party for Kailyn for tomorrow but I don’t know that the weather is going to let that happen. Either way today will be spent making her feel special! I am not going to post a recap of last month’s goals because quite frankly I didn’t pay much attention to them. For the month of November I kind of lost focus and I think I’ve figured out why: I’m not busy enough! This means if you only have two hours to get something done you’ll get it done in two hours. However, if you have eight hours to get something done you’ll make the project fit the whole eight hours. This is a problem for me because when I have too much time I tend to over think things and therefore not come up with my best work. So the goals this month will be all about filling my time with all of the right projects. I am only going to post my business/income goals this month so I can create a stronger focus. So, here it goes. I need four weekly blogging jobs (well, just four posts) to meet my blog writing income goals. Then I’ll move on to my next writing goal. from Amazon which should arrive today. This book has thousands of print writing markets and includes contact names and pay rates. I want to start submitting queries to small publications. I am thinking about trying some small parenting or regional magazines. From what I read print publications pay much more than online writing does. I am hoping to eventually make magazine writing a decent percentage of my income. I have still been seeing my traffic on this blog grow despite not having a guest post published yet. I am amazed what simple SEO did for my traffic and how it’s continuing to increase. I also implemented everyone’s suggestions from Monday’s post and will continue to do so. I do have 4 guest posts coming out this month. I am predicting that my traffic will increase 3-4 times of what I originally posted. I’ll give you an update at the end of the month. Defeat our Debt is doing good! And, I’m happy about that. The stats have continued to grow and I actually might make my first few bucks off of it next week. I have something in the works just waiting for it to come through. I also wrote a short eBook for D.O.D. in November to offer to email subscribers and people are already subscribing. I want to post at least once a week to keep the blog in good standings. I am thinking that within the next two months DOD will become profitable! November was one of the lowest income months I’ve had in a while and that was due to my slacking. But I’m back and am going to work harder than ever! I have been limiting myself by keeping my income goal at $2,000 knowing that I don’t have to work very hard to receive that $2,000. I need to inch up the income goals or else I’m not going anywhere. Whether I hit the $2,500 mark or not….only time will tell. Either way I’m gonna give it my best shot. So you’re probably wondering what I earned in November……it wasn’t anything great, actually it was kind of lackluster but I wanna keep it real so I’m going to tell you anyway. Nothing special but still more than enough to cover all my expenses. So, that’s that. What’s going on with you? Looks like you are definitely headed in the right direction with your online income! Magazine writing would be awesome because you can focus on longer articles instead of shorter blog posts…at least it sounds attractive to me haha. Hope you have a great weekend! A plan of attack. Yeah, I need one of those? With your plan and focus, you will definitely keep moving ahead. No worries at all. I completely agree with Parkinsons Law. I try to set a timer on my desktop and “beat it”. I usually have to go back and spend a few more minutes for edits, but well worth the practice. I have been trying the timer thing too. It really does work when I remember to do it. I need to start using it more and I’d be able to get a whole lot more done! The time idea is great! I seem to let my time for work expand into whatever time is available which is not the most efficient plan at all. I think timing tasks might be a great idea. Happy birthday to the cute Kailyn. Thank you, Terry! Have a good weekend! You have a great work ethic! I actually do the opposite of that law. If I have more time I try to hurry up and get it done so I can accomplish some other things, but I don’t submit my project until it’s actually due. I know kind of strange. Hope the freelance work picks up this month for you. I think you have some great goals you want to achieve! That’s good to have that opposite effect though. I wish I did that. I do usually do the same with deadlines and freelance work though. If I get something done ahead of time I hang on to it and do a few edits and then submit it. 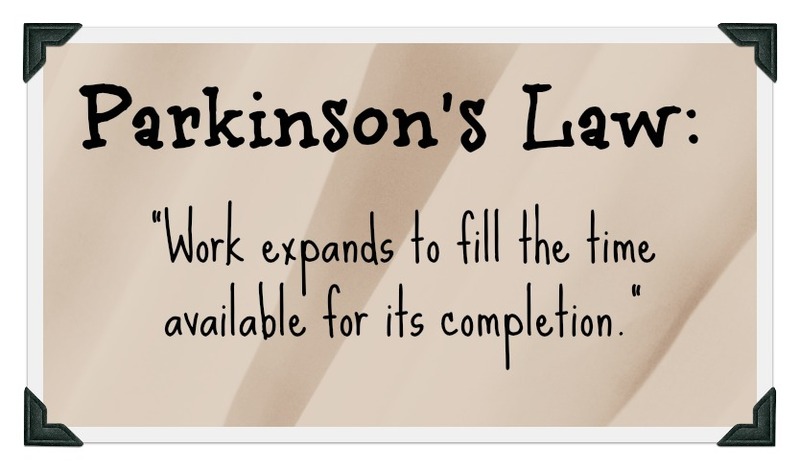 Parkinson’s Law is maybe the coolest observation in all of time management. I find it to be true, regardless of your personality or tendency to procrastinate. We all know how things get done right before deadlines. The rub, for me, is that a “true” externally imposed deadline (e.g. – boss telling me this will be done by this time and date) is so much more powerful than an internally imposed, but ultimately contrived deadline (e.g. – I tell myself I will have X done by noon). Do you have any tips on how to empower your own deadlines? I have the same problem as you. If I am writing a bunch of blog posts for other people I get them done no matter what because there is a deadline and if I miss the deadline there are some sort of repercussions. However, when I’m working on my own things there are no harsh consequences. This is something I’m working on. I think making clear goals helps and also using a timer. I have used a timer off on. I’ll set it for 25 minutes and really focus on one project. That helps a bit. But I am still trying to figure out how to follow through a bit better on self imposed deadlines. That’s a great tip, Alexa. I’m going to steal that timer idea. If it gets me out of bed after all these years, it must have some power! Happy Birthday, Kailyn! Have fun playing in the snow! Happy birthday to Kailyn, I hope you guys have an amazing weekend celebrating! Your goals are so inspiring and I wish you the best of luck! I am sure you will make it! Your determination is simply amazing and I can only learn from you! Very cool! 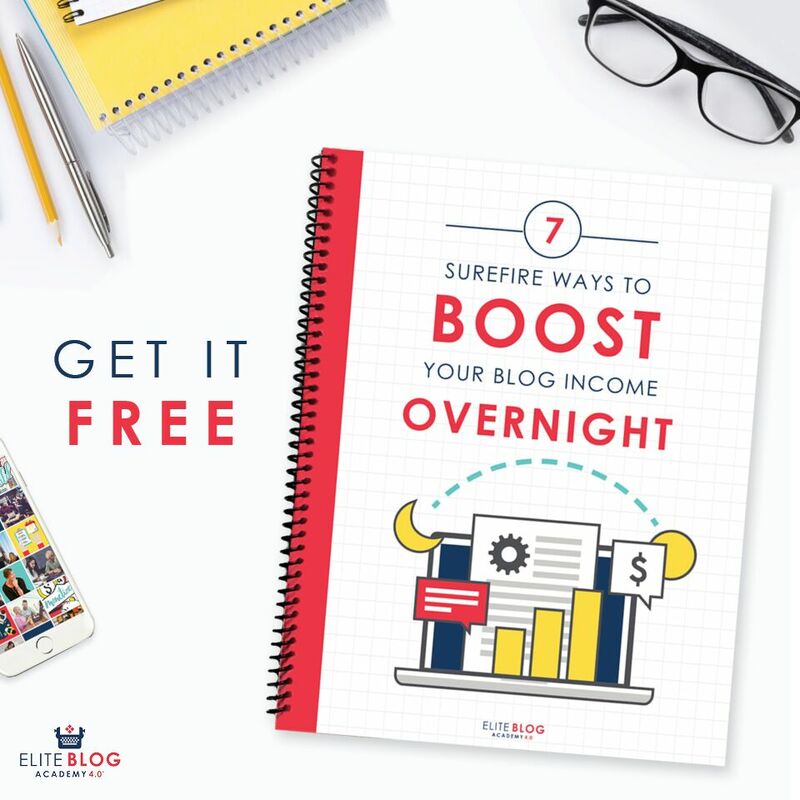 Almost $1800 in blog income is NOTHING to sneeze at! Congrats! I am a new reader of this blog so I apologize if you’ve answered this in a previous post — maybe you can post about this if you haven’t already (like you don’t have enough to do, lol) — but HOW do you juggle taking care of the kids and doing freelance work?? I made $150 today through freelance copywriting and I feel like I ignored my kids all day! (They are 9 months and 2.5.) Do you just wait until they go to bed and then work all night?? Or are they at their dad’s house during the day? Maybe I just have a time management problem…I should be working when the kids nap but I usually end up falling asleep myself, LOL! I know what you mean about feeling like you ignore the kids. I pretty much try to stay off of the computer (If I can help it ) when my kids are home and awake. They hang all over me so it’s hard to even check email with them. I just quit the day job in late October so I am figuring out what works now although I do take them to the babysitter some. But I pretty much work when they are at their dads house which is twice a week and every other weekend. (We do shared parenting.) And, I work after they go to sleep for around 3 hours or so each night. I was working all night long some nights when I was still working the day job which is why I thought it would be wise to quit 🙂 But now I’m finding I am really not as busy as I’d like to be so I am in the process of figuring out what my routine should look like. It definitely takes some trial and error. Oh the joys of birthdays of our children! It is fun to see them think and act like they are ready to face it all as they add number to their age but in the eyes of mothers, they will always be little babies. By the way, congratulations on being so determined where your financial goals are concerned. You are inspiring a lot of people. Thank you! I kind of just went with the theme of my blog for the ebook. Just a general guide to starting a side business. I think you should write about what you know well. It will be much easier to write. With the other blog I have I just came up with an outline and then used old posts for the basis of the ebook. I went back through the old posts changed them up a bit and added new stuff to make the ebook flow. It was pretty easy to do. Happy birthday to your little one! She is adorable! I didn’t do as well as I had hoped in November either. I’m more or less just beginning but I hope to get to your level one day. It would be nice to just cover all my expenses which would be possible on that level. I just need to focus too. Let’s do it! Very interesting about Parkinson’s Law. This past month was very slow on side hustles, and I feel lazy because of it. Or it’s made me lazier? I’ve less likely to hustle and search. I am getting more motivated for 2014 but seriously need to boost my income to meet my debt goals. I think you’ll hit your goals just fine. Do you spend much on your car Alexa?? I know you are cheap like me and get by on low income like me too! I also work from home and am debating on how how much i want to spend on a newer (slightly used) car. Just wondering what your thoughts are on that?? I have to have a car where i live. However, when I got the trailer the only thing I had for collateral to get the 10k loan was my car so I borrowed against it. So technically I’m paying $226 a month against my car (four year loan) for the trailer. If I had to buy a car again I would definitely look for something quality so that it lasts a very long time and has few repairs. I think paying less for a car that’s going to break down all the time will cost you more in the long run. I’m like you though. There’s absolutely no way I couldn’t have a vehicle where I live. I love all of the information that you find out and share with us!! Thanks you. A huge Happy Birthday to your little girl. She’s still really little and so cute! Take pictures-time flies. Parkinson’s law is so true! It’s what makes me think I could be a great consultant one day, it just doesn’t take me 40+ hours a week to be effective at my job!